A man has been charged with aggravated assault with a deadly weapon after sending a journalist who has epilepsy a tweet containing a strobing GIF. Senior Newsweek writer Kurt Eichenwald had an eight-minute epileptic seizure after viewing the message, and suffered from after-effects for several months. 29-year-old John Rayne Rivello was arrested on Friday, three months after sending the “weaponized tweet" to Eichenwald. The Washington Post reports that Rivello's charges cover hate crimes, “based on alleged anti-Semitic bias associated with the crime.” He was released yesterday after posting $100,000 bail. Rivello appeared to have covered his tracks well, using an anonymous Twitter account on a prepaid SIM card he had bought with cash. But newly unsealed documents uncovered by The Verge reveal how he was eventually found. Police started by sending a court order to Twitter asking it to hand over all details relating to the @jew_goldstein account, which Rivello used to send the Tweet. 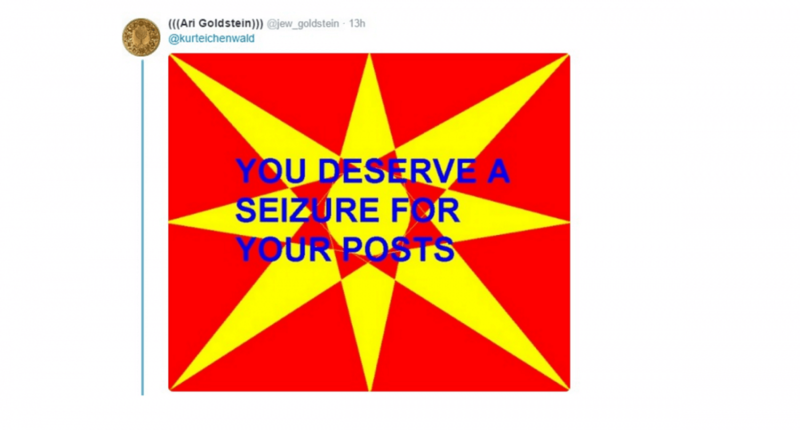 His message also included the words "You deserve a seizure for your posts." Twitter’s info didn’t reveal much more than a dummy email address, but it did contain the Tracfone number Rivello used. There were no subscriber details associated with the number, so police turned to AT&T, which supports that Tracfone SIM. The telecoms giant couldn’t offer any clues to the perpetrator’s identity either, though its toll records showed the SIM had been used with an iPhone 6. After sending Apple a few warrants, the Cupertino company revealed the number was associated with a five-year-old iCloud account owned by John Rivello of Salisbury, Maryland. Rivello’s iCloud account included a screenshot of Eichenwald’s wife’s response to the strobing GIF, another screenshot of Eichenwald’s Wikipedia page that had been altered to show a date of death, and other incriminating evidence. There was also a picture of him holding up his driver’s license showing a photo and address, which made finding him a lot easier. Authorities say Rivello targeting Eichenwald “as revenge for what he saw as the reporter’s critical coverage of President Trump.” Eichenwald recently tweeted that in the time since the attack, he has received more than 40 other GIFs with strobe effects. “Face of the alt-right” Richard Spencer has defended Rivello, tweeting: “There’s now a legal fund for Jew Goldstein. It debunks @kurteichenwald claims.” The fund currently stands at $11,915 from 278 contributors. "More than 40 ppl sent strobes once they found out they could trigger seizures." Please keep politics like this off of Techspot. I think the big story is that Apple spilled the beans in this case but Apple refused in the case of a terrorist on American soil with dead Americans. How did they get his Apple ID passcode this time? And does Apple comply with search warrants or not? I think this is just silly. I suppose, if you knew you were epileptic, you should take steps to reduce things that would activate this. Dimming your screen could be a start. I guess, that is unless the guy specifically knew the recipient was epileptic and that the receiver didnt know. Not sure how that would happen. Maybe I'm too insensitive? There's just got to be so many other things in life that could have triggered it. I've had friends go into seizures from apparently nothing, could have been a coincidence. Again, maybe I'm insensitive to this because my friends take steps to lower their risks. Capaill and cliffordcooley like this. This sets an interesting precedent and I wouldn't be surprised if it has "unintended" consequences later on down the road. How soon will it be before sending an unprotected gif is reckless endangerment because some random with epilepsy stumbled across it without warning? Seriously?! People are defending this *******? He clearly wanted to cause harm which is very different from 'fun' or 'random GIFs on the internet'. This is the internet equivalent to punching someone through the screen. Don't blame the victim by suggesting they dim their screen or watch out for gifs. Would you tell a woman to watch out for men so they don't get raped? Would you tell a woman to watch out for men so they don't get raped? Yes. In fact, I would tell her to avoid certain parts of town at certain times of night as well. Because common sense, which Eichenwald has none of. Nobody is defending deliberately sending strobes to epileptics. Rather, people are disputing "assault with a deadly weapon," which makes sending a strobe to a fool the equivalent of pulling a gun or knife on him. It's a BS ruling. I understand not blaming the victim, but that doesn't mean you should throw all caution to the wind. During the holidays we are told to keep our gifts/purchases hidden in our vehicles and not in plain site when we are out shopping to reduce the chances of a break in. Good advice is still good advice. It's not your fault you were victimized and it doesn't hurt to be cautious. Kotters, SirChocula, Squid Surprise and 1 other person like this. The most interesting part about this story is how they found him. The worrying aspect is how easy it is for a state to fabricate that. Not saying that this here is, just pointing out the possibilities. Its what makes internet services like Facebook also ridiculously powerful. Just imagine if they create a profile of you and then commit crimes with it. This article is about using flashing GIFs to cause epileptic fits. Providing a little context does not make it political. Tanstar, spectrenad, cliffordcooley and 2 others like this. Yes, I don't want to make it seem like the world is peachy and throwing caution to the wind is smart. Agreed - the charge can be disputed, perhaps may just "assault" or some form of lesser "intent to cause harm", which is why we have lawyers. But some people above seem to think the recipient is to blame. It just seemed from some posts that people thought there should be no charge at all. Eichenwald is a member of the media, and not a particularly likable one. There is no small number of people who would like to see no charges brought against his "attacker." It is a consequence of the times (you'll note that if someone did similar to Trump or his supporters, many of these people [in the media and on this forum] would praise it). Personally: He stepped into the arena. I couldn't possibly care less if that decision had consequences for him. However, the intent to harass and cause harm is rather clear here. Dude should be charged, but not with AWDW. Kotters, spectrenad and cliffordcooley like this. Like anything else, technology will have it's own fair share of perils to those that are unaware. Be it through these emails or for the ***** that chooses to hack the physicians access to the heart monitor and change the settings, the more we have the advantages of technology there will be an equal amount of risks. Until there are grave penalties for those that insist on doing so, there will be few, if any limitations. Stand a dozen hackers in front of a firing squad, broadcast all over the internet and some of these potentials will back down and behave themselves, but others it will continue to be a game and until the technology marvels can create an equal amount of securities, we shall all be susceptible to abuse. Guy went through all that effort all to forget he was screwed from the start. Whatever you put on the cloud can be subpoenaed. Your analogy doesn't quite match his. You are essentially equating twitter to crime ridden neighborhoods. It may be common sense to avoid bad neighborhoods at night but it is literally impossible to avoid these GIFs on your twitter feed if you use twitter. With that you are essentially saying he has no common sense just for using twitter just like everyone else does and that is an obvious double standard. Wrong. Twitter lets you disable auto play for animations and video. This is to say nothing of disabling it via the browser. He didn't disable either. That was very foolish for someone with such a serious condition. Reehahs and Capaill like this. Your wrong they are easy to avoid if you are susceptible to strobes I would think you would avoid things like twitter and it ilk for your own safety. If you don't and something happens to you I believe it's just Darwin at work, next thing they'll charge you with is hurting someones feeling and causing them to need therapy. The cotton batten world is coming closer and closer. FYI Darwinism doesn't apply to humans. If it did governments wouldn't exist and neither would social programs. "Your wrong they are easy to avoid if you are susceptible to strobes I would think you would avoid things like twitter and it ilk for your own safety"
You contradict yourself in one sentence. How exactly is it easy to avoid twitter and all other forms of social media? Answer, it's not. Following your logic these people who are already disadvantaged should avoid any medium where they can see strobing images. Hey, here's a simple solution. How about we not send strobing images specifically to epileptic people? Just like how you wouldn't like to be bombarded with wiener pics, don't go out of your way to be a troll. It easy to avoid twitter and the social wastes of time opt out and use the time you would waste on them doing something useful. You didn't give this idea a single quantum of a thought, did you? How exactly is it easy to avoid twitter and all other forms of social media? Answer, it's not. Following your logic these people who are already disadvantaged should avoid any medium where they can see strobing images. Hey, here's a simple solution. How about we not send strobing images specifically to epileptic people? Just like how you wouldn't like to be bombarded with wiener pics, don't go out of your way to be a troll. 1. Don't use social media. It's complicated, but once you learn the basics it's like riding a bike. Reehahs, cliffordcooley and wizardB like this. That doesn't solve the issue that any electronic device can deliver those images. Also, you are seriously suggesting they quit because they were essentially bullied off those platforms. It is in Twitter's best interests to prevent that. Twitter is one of the worst time wasters out there a app populated by twits quit it and let your brain heal.